Is it possible to shine a light on infected tissue, and only kill the viruses, leaving healthy tissue intact? A father-son team combined physics and biology to prove that it is indeed possible. Kong-Thon Tsen, a physics professor at Arizona State University, was talking with his son Shaw-Wei Tsen, a pathology student at Johns Hopkins, about antiviral treatments. If a vaccine is not available for a viral illness, treatment options are extremely limited. "We have demonstrated a technique of using a laser to excite vibrations on the shield of a virus and damage it, so that it's no longer functional," said Tsen senior. "We're testing it on HIV and hepatitis right now." Tsen and Tsen have demonstrated that their laser technique can break up the protein shell of the mosaic tobacco virus. When completed, the treatment leaves only a harmless film of molecules. The ultra-short pulse (USP) laser releases energy in pulses just one femtosecond long; that's one millionth of a nanosecond. The USP laser can kill the virus using a principle called "forced resonance." Every virus has a unique molecular structure; for each virus, there is a unique frequency that will cause it to vibrate. It is analogous to the way that a fine crystal glass will resonate, or vibrate at a particular frequency. If you increase the volume at that particular frequency, the glass will vibrate violently enough to shatter. Similarly, by putting more energy in to the USP laser, the virus shakes itself apart. So far, their technique has only been used in test tubes; animal trials must follow, with human trials further into the future. Mary ...went through the tuned-laser decontamination process, coherent beams at precise wave-lengths passing through her flesh to zap foreign molecules within her body. Already, similar devices were being built in Mary's world to treat many forms of infection. Neuroscientists hope that by tracking the pulses of just forty-one of paralyzed Eric Ramsey's neurons he might learn to communicate verbally - by thought alone. The National Sleep Foundation estimates that as many as one in three Americans snores at least occasionally. Rather than using primitive steel tools that haven't changed too much in the last several thousand years, doctors will focus high-intensity ultrasound beams at a particular spot in the body. 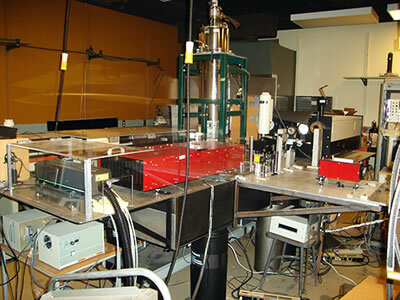 Take a look at an earlier story about the Radiance ultra-short pulse laser. Story via Wired.